Cocoia Blog » Boyhood Crush Confessions. 06 Dec Boyhood Crush Confessions. Gedeon Maheux voiced the idea of confessing your boyhood crushes on December 6th, and I decided to participate – if only for my mental health in that I am not the only one having had a crush on cartoon (and Star Wars) characters in my boyhood. Although I could only dig up a limited amount from the dark recesses of my memory, this may go down the slippery slope of geeky crushes, so don’t say you weren’t warned. 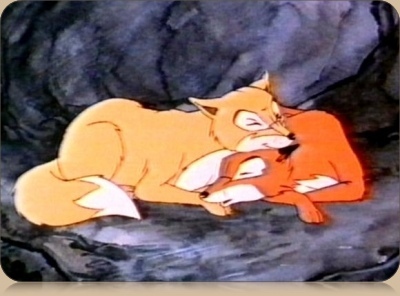 It’s a bit pathetic, perhaps, but when I was quite young I used to watch every episode of the Animals of Farthing Wood, which featured two foxes as the main characters. The female fox, Vixen, voiced so elegantly by Stacy Jefferson, (although my crush was developed by the Dutch voiceover, which was more female and warm) was very attractive to me. What probably strengthened by illusionary ‘bond’ with her was the constant endangerment of her life in the series. When I was 9, I played Baldur’s Gate (part 1), and I developed a love for Jaheira. Jaheira, being a female druid with a thick Russian accent in the voiceovers, was unfortunately married to Khanid (who gets disposed of in Baldur’s Gate 2, to my great satistfaction), fueling my interest. Jaheira had a beautifully drawn portrait. Baldur’s Gate and its sequels are very immersive, like a great novel, and has you feeling emotionally connected to your party characters most of the time. 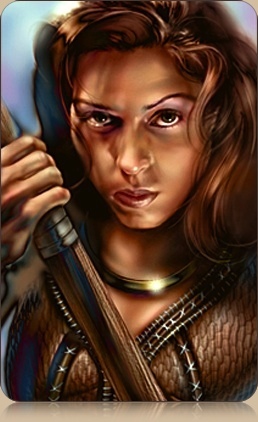 Jaheira’s portrait, courtesy of Black Isle Studios. Last but certainly not least is any geek’s boy crush; ‘Princess Leia’, or Carrie Fisher. She played the damsel in distress in the Star Wars movies and any self-respecting geek developed a crush on her in his boyhood. I am still amazed how haircuts of such a caliber cannot help deter young boys. Since being put in grave danger in the beginning of the first movie, through her temporary slavehood at Jabba, up to marrying Han in the end, Leia really is the guiding thread of the Star Wars story. I couldn’t possibly put it in words better than Gedeon did. Princess Leia enslaved, courtesy of LucasArts. That’s it for my boyhood crushes; sound yours off in the comments if you are inclined, but most importantly, don’t forget to check out these other bloggers’ crushes – if you don’t think I am a madman just yet =) . Oh geez! I thought I read “Animals of Fart-ing Wood!” I nearly feel out of my chair :) Not to worry. I think I’ve fallen in love with a man’s voice on several occasions. Jaheira- I wish I looked like that. 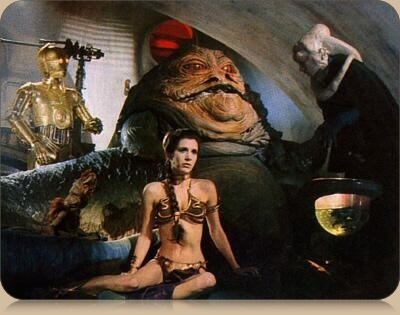 Okay, what is up with Princess Leia? Is she a staple? Was it the buns or the outfit? Sandy, I bet it was the buns as much as the identification with Han Solo that all boys have, intrinsically. He’s like the cool(er) guy. Putting her in the middle of a guy with a futuristic gas mask on his face and horrible space monsters also puts things into perspective, I think ;). OMG, I totally forgot Speed Racer. I still know the song. Lots of fun! My humble apologies for the speculation I made on my blog, regarding the cartoon characters, I listed. I used to watch Animals of Farthing Wood. Classic.